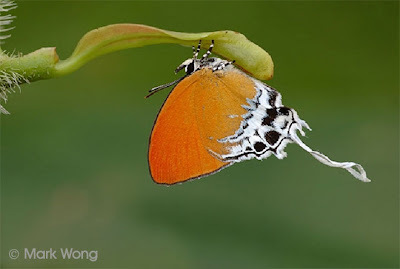 This pretty forest butterfly is always present to greet visitors to the nature reserves of Singapore, never failing to delight nature enthusiasts with its bright orange colouration and long white tails. 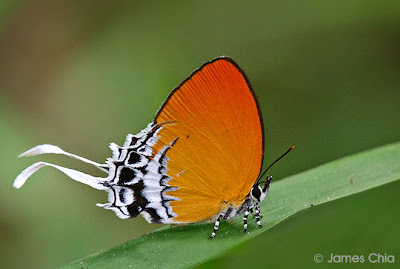 It is often seen fluttering in the shady understorey and thick vegetation, and rarely moving out to bright sunny areas. The Branded Imperial is local in distribution, but is not uncommon. Frequently, a few individuals are observed, frolicking and chasing each other in shady vegetation. The wings are blackish brown above, with a white tornal patch on the hindwing. 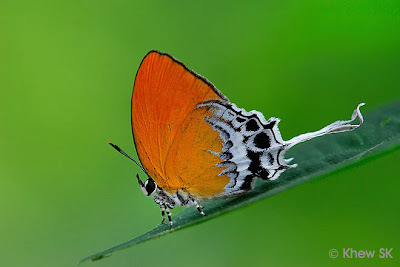 The underside is a reddish orange, with an unmarked forewing, with the hindwings featuring large black submarginal spots on the white tornal area which is fringed by an irregular black line, separating the white tornal patch from the orange area of the hindwing. The eyes are an opaque jet black, as are the antennae, whilst the butterfly has black-and-white banded legs. There are three pairs of tails on the hindwings, of which the one at vein 2 is the longest, often measuring about 1cm in length. The Branded Imperial has a short skipping flight, as it flits from perch to perch at usually no more than a metre above the ground. 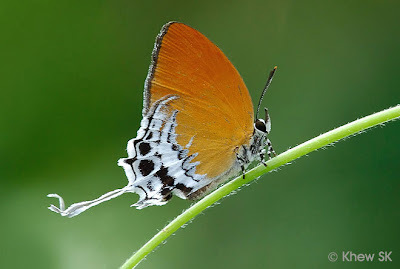 As with many Lycaenidae, the tails and 'eyespots' on the hindwings are believed to function as illusionary decoy to fool predators into attacking the tails rather than the vital part of the butterfly. 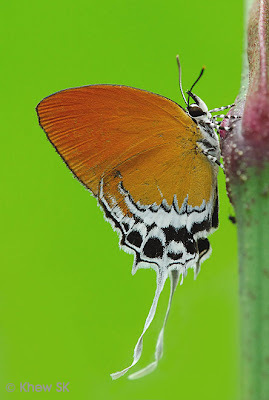 Indeed, if one is to observe the Branded Imperial at rest, individual sometimes move their hindwings up and down and their tails twirl and move in the light forest breeze, giving it an appearance that the combination of the hindwing eyespots and the tails are the head and antennae of the butterfly. Occasionally, several individuals can be observed feeding on the sap of young shoots of various species of forest plants, where the butterflies are so busy feeding on the sugary-sweet sap that they even allow observers to touch them! The Branded Imperial's early stages have been recorded on its preferred host plant, Smilax bracteata, a forest climber which is considered a "pest" and a threat to the trees and large bushes onto which the vine climbs and slowly suffocates.